A schoolteacher from Knaphill who helped to save the life of one of her pupils has won the 2016 Allergy UK Hero Award. Not only did Jo’s actions help to save Freddie’s life during the incident at Holy Trinity CofE Primary School in Sunningdale, near Ascot, but her care and compassion for the boy and his family helped them to deal with their anxiety and post-traumatic stress disorder after the incident. She went on to win the top award of the evening after guests voted for the overall winner from the five categories. Over the past 25 years Allergy UK has been providing information and advice to the one in three people in the UK living with allergies, and working with healthcare professionals to improve diagnosis and treatment. Carla Jones, the charity’s chief executive said: “There was no better way to celebrate our 25th anniversary than to publicly recognise those who have helped people whose lives have been affected by allergy, from family and friends to caring health professionals. 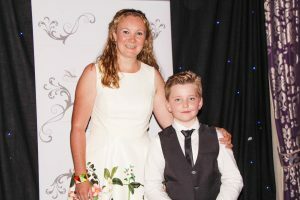 “We had five worthy category winners and our guests chose Jo as the overall Allergy UK Hero Award winner because of how she helped Freddie and his family. “All too often there is a lack of understanding of what this can really mean to individuals and their families. Our Allergy UK Heroes are a huge inspiration for us and for the people we help,” Carla said.